PF: How can ITO providers differentiate themselves in today’s market? Is it by vertical focus, or other elements? FD: Given the extraordinary pressure that clients are under, I think that the key to differentiation is to focus on how to make clients’ businesses stronger. Rather than focusing on technology, process or methodology, I think providers need to really understand a client’s business drivers and then sell and deliver solutions that further those business objectives. As I said before, clients are facing both cyclical and secular pressures. As a result, depending on the client, their objectives of outsourcing will be very different. Some clients seek to improve efficiency or effectiveness. Others are looking to use outsourcing as a enabler of innovation. Still others are looking at outsourcing as a tool to gain access to the best talent in the world – regardless of where that talent is located. And of course, given the significant secular changes we are seeing, many clients are looking to outsource as a way to enable agility and transformation within the organization. Against this backdrop, I think providers can differentiate themselves in a number of ways. First, vertical knowledge is key – you have to understand your clients’ business in more than a cursory way. Second, you need a world class, tightly integrated global delivery system – just having scattered delivery locations around the globe is no longer enough. Third, you need to have a full range of services and an organization that has the ability to put bundles of services together in creative ways to craft tailored solutions for clients – the old thinking of outsourcing “towers” is somewhat limiting in that it tends to consider outsourcing as a series of silos. Finally, consultative relationships with your client are critical – in today’s world, providers that rely on contracts and SLAs as opposed to consultative relationships don’t find too much success. PF: How about BPO – how do you see this market developing, and are you seeing the worlds of BPO/IT coming closer together? Can you see more of the IT-centric service providers such as Cognizant developing more BPO-centric services? FD: I think that the case of IT/BPO coming together is extremely strong. In fact, I’ll go as far as saying (maybe controversial) that BPO which is based solely on labor and process is not a sustainable model in the long run for most business process areas. The evidence of the synergies that can be unlocked when ITO and BPO are combined together is compelling. We have demonstrated this synergy in many cases and we continue to push the envelope on delivering IT/BPO synergies through automation of processes and also through development of common tools and platforms that we can share across multiple customers. PF: And finally – you have had a very notable rise to prominence in the outsourcing industry over the last decade. What advice would you impart to ambitious executives today hoping to achieve success, especially in light of the economy? PF: Frank, thanks so much for sharing your views with us. 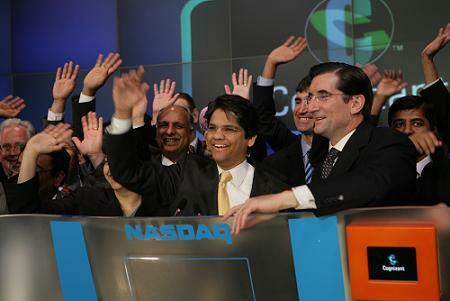 Francisco D'Souza (pictured center, March 2007) is President and Chief Executive Officer of Cognizant Technology Solutions. Although Frank's advice about vertical knowledge, world class delivery, range of service and consulative relationship with customer is solid and is a given for any market conditions, it is not enough in the current conditions. Even though may have all these things in place, today's customer is under so much pressure that cost becomes the only differentiating factor. More so because most of the known outsourcing vendors have the maturity in all the factors mentioned by Frank. What remains to be seen is who among the outsourcing vendors are able to sustain such cost pressures and price wars to emerge as a leaders ahead of the pack to ride the next wave of growth. Vikas is being too polarized with his thinking here. Yes, cost-containment is the order of the day, but firms are faced with so many challenges to their very survival, many other key factors are being considered, namely culture of service provider, capability to develop global market presence and - as Frank points out - vertical experience in process and technology. Frank is dead-on with his observation regarding a tightly-integrated global delivery model. Too many service providers have loosely-arranged global delivery centers, with unsufficient scale and coordination. This is an area where Cognizant and some of the other leading service providers can win out in this tough market, and keep their costs down. Frank is right about IT and BPO coming together as a synergistic offering. "Pure Play BPO" will be a thing of the past very soon. Service Providers will have to look at partnerships with customers and develop common platforms that can be monetised. This can only be acheived by weaving IT and BPO together. while I am not ready to put a nail in the coffin of BPO yet, I have to agree--5 years from now the distinction between ITO--particularly ADM--and BPO will be so blurred we will need a new name for it. It is well said in the end; focus with your value, people and finance and any industry incl. outsourcing is promising.